How to steer a car using the 'pull push' technique. Steering a car without crossing arms is important. 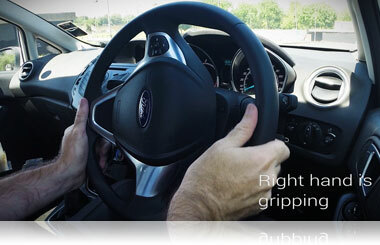 Professional drivers recommend the 'pull push' method of steering as the safest and most effective way of steering. One reason for not crossing your arms when steering is because modern cars have an airbag in the centre of the steering wheel and crossing your arms when steering will block this if it ever needed to explode out. An airbag explodes out with a lot of force and could force your arms towards your face. Another reason against crossing arms when steering is that you have less power and control should you need to steer back the other way quickly. Imagine the steering wheel as a clock. You should hold the steering wheel at either a 10 to 2 (see photo) or a quarter to 3 position. 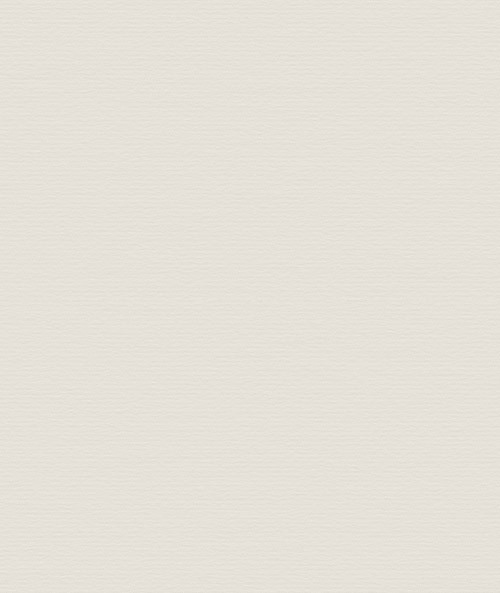 You should keep both hands on the steering wheel at all times unless changing gears or using one of the cars other controls. This means that if you hit a pot hole then you'll still have full control of the steering wheel. You can practice the pull push steering with a plate and pretend it's a steering wheel (be careful not to drop it!). Feeding the steering wheel through from one hand to the other. Your right hand must always stay to the right half of the steering wheel and your left hand should always stay to the left half. 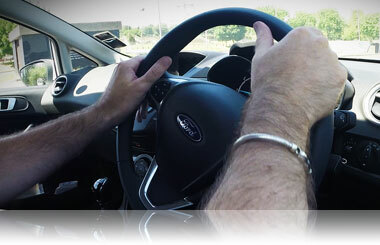 To steer full lock (maximum steering) right, you would start with both hands at the top of the steering wheel. 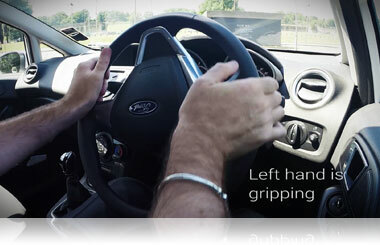 You would pull down with your right hand gripping and your left hand would not grip as it would slide down the left side of the steering wheel opposite to to your right. Your hands would then meet at the bottom. Now your left hand grips the steering wheel as it pushes up and your right hand slides up (opposite your left hand) to meet at the top. Your right hand now grips as it pulls the steering down and the left hand slides down opposite (you should have full lock now). To steer left is the same process, just the other way. Start with both hands at the top of the steering wheel. Your left hand will now grip and pull the steering wheel down as your right hand slides down to meet it at the bottom. Your right hand will now grip the steering wheel and it will push up. Your left hand slides to the top to meet your right hand and it continues until you can't steer any more. Once you get confident with the pull push steering you will then be able to gradually steer quicker and more effectively. Video on the pull push steering in action!